For those poor Noob Noobs who may be unaware, Rick and Morty follows the adventures of an alcoholic genius scientist and his grandson’s dangerous missions throughout the multiverse, resulting in one of the most hilarious television series in recent history. This Pop! 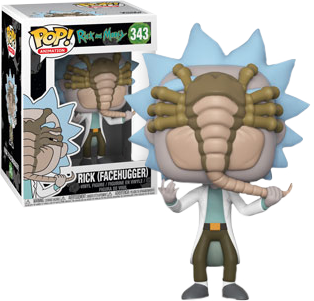 features the alcoholic yet brilliant scientist himself, Rick Sanchez, however he's in a bit of bother with a Facehugger on his face, which comes from crossover TV spot of Rick and Morty and Alien: Covenant.